Spoofing the Die Hard formula with a portly mall cop in the Bruce Willis role may not be a lofty idea, but it seems simple enough, especially considering the number of mostly non-comedic imitators Die Hard has spawned over the years. 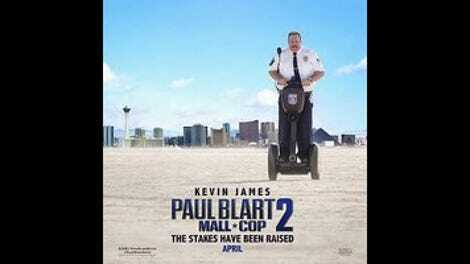 Yet it’s taken Paul Blart two whole feature films to fail at this task. Both movies deck out their opening titles in a shiny gold logo and faux-serious score—then, instead of undercutting the seriousness with jokes, immediately put any and all spoofery on hold while painstakingly establishing and re-establishing hypoglycemic security officer Paul Blart (Kevin James) as a sympathetic underdog. The most surprising thing about this process is how sad it is, even after Blart’s first-movie triumph of defending his mall against a gang of skateboarding assailants. The original Blart opened six years ago, just months before Jody Hill’s pitch-black Observe And Report, and while the tonal and technical differences between the two are vast, they’re surprisingly similar in their indexing of life’s cruelties. 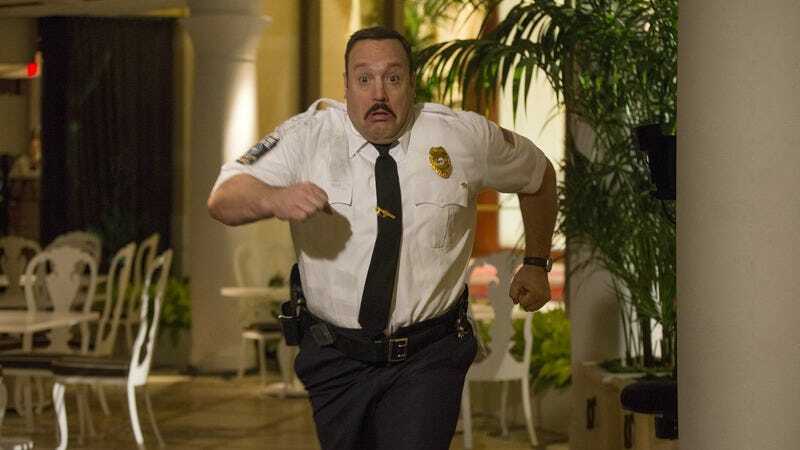 If anything, Paul Blart: Mall Cop 2 ups that sadness quotient, spending much of its opening proving that just because these movies are stupider than Observe And Report doesn’t mean they have to be less cripplingly depressing. Rather than writing off Blart’s tentative relationship with his love interest from the last movie, it shows them marrying and Blart getting served with regretful divorce papers six days later; rather than having Blart’s mother pass away peacefully offscreen, the filmmakers show her getting killed by a milk truck. The movie adds to this darkness a layer of hangdog self-pity that’s supposed to be endearing, but it actually makes Blart funnier and more recognizably human. Depressed by his inarguably tragic life, Blart takes his teenage daughter Maya (Raini Rodriguez) on a trip to a security convention in Las Vegas. From there, the Wynn resort in Las Vegas essentially functions as the airport in Die Hard 2: a bigger location for a reprisal of the first film’s formula. And sure enough, just like its predecessor, Mall Cop 2 takes its sweet time putting Blart into conflict with a bunch of armed thugs. Before he can run afoul of art thief Vincent (Neal McDonough, perfectly cast as a poor man’s Die Hard villain), Blart must express his dismay that his nearly adult daughter would do anything on her own. He also spends a lot of time mistakenly rebuffing the non-advances of hotel manager Divina (Daniella Alonso)—who then inexplicably finds herself drawn to him. This means that Paul Blart: Mall Cop 2 has a subplot constructed around the pick-up artist concept of “negging.” There’s also a creepy scene where Blart convinces a stranger she should be happy that one of his colleagues has drunkenly hit on her. Despite this tedium and occasional creepiness, the sequel generates more laughs than the original, which couldn’t even muster appropriate levels of zaniness. Here, there are a few moments where James shakes off his muttering and yelling routine—dialogue-based humor isn’t really his strong suit, but he has a pretty funny verbal confrontation with an underplaying McDonough. A few of the security expo details are amusing, like how it gathers groups of good-natured portly fellows in short-sleeved button-down shirts who talk about whether they have a go-to “belt guy.” James also looks like a potentially decent physical comedian—though in the hands of director Andy Fickman, few of his pratfalls and sight gags make any visual sense. Like a lot of CG-assisted slapstick, they mostly depend on something physically impossible happening instead of unlikely elements snapping into place. That fits in with the movie’s general aesthetic of low-budget indifference. Though the movie was clearly filmed on location at the Wynn (not passing up free vacations being the driving ethos of Adam Sandler’s Happy Madison Productions, which made both Mall Cops), the digital cinematography gives the over-lit Vegas environment a home-video texture. Scenes as simple as two groups of people standing in a hotel suite (or is it a hallway? The movie’s geography is muddled) look green-screened, whether they were or not. The opening credits and one shutter-adjusted fight scene are the only tenuous connections the movie forges with its obvious action-movie inspirations. Then again, maybe Paul Blart isn’t spoofing John McClane after all; maybe these movies are actually too stupid to realize what they’re imitating.